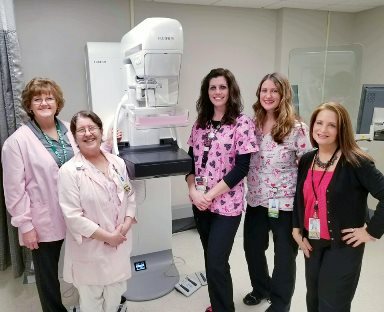 The Franklin Hospital Mammography Technologists Lois Waters, Dorothy Cocke and Heather Shelton (with FUJI trainer Maria Paroz and Imaging Director Daniell Weinhoffer) are excited to help with all of your Mammography services and questions. 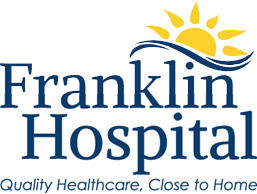 Franklin Hospital now offers both 2D and 3D Mammography. This system is amazingly comfortable and has images that are of the best quality!! Remember - Breast Cancer caught early is 98% curable - don't put this off! Call 439-3161 ext. 321 or 320 to schedule your appointment. Walk-ins are welcome if you are over the age of 40 and have not had a mammogram within the last year. No physician's order required. We offer early AND late hours Monday through Thursday 6:00 am - 6:00 pm; on Fridays we are here 7:30 am - 4:00 pm.